The upcoming referendum on the presidential system will be a vote for democracy and should be considered irrespective of political parties, main opposition Republican People’s Party (CHP) leader Kemal Kılıçdaroğlu said on Feb. 7. “This referendum is not a party issue. It is an issue for the country. It is an issue of democracy. This decision will be a common decision for all of us. This is not propaganda either. In this referendum, we are not deciding on a government, we are voting for democracy,” he said at a party parliamentary group meeting. He said the referendum will be a choice between “democracy and a one-man rule,” while adding that the system change promoted by the ruling Justice and Development Party (AKP) and Erdoğan will not cease any of Turkey’s problems. 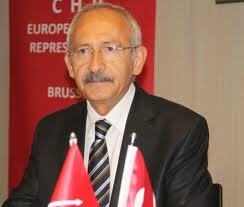 Kılıçdaroğlu has relentlessly promoted the “no” vote for the upcoming referendum, which he believes will bring drastic changes to Turkey. “Will it solve the terror problem or unemployment? Will it preserve the value of the Turkish Lira against foreign currencies? Will it fix strained relations with our neighbors? Will the food prices decrease? Will there be economic stability, or will the education system improve? No. Then we should increase our ‘no’ votes in the referendum,” he said. Kılıçdaroğlu also argued that during 15 years of AKP tenure, the government has been able to implement everything they aimed to, suggesting that the planned system change was not a necessary change, unlike what its proponents put forward. “They are eradicating the prime ministry and ending the ministries too. What is it that they did incomplete? I asked Mr. Yıldırım, I did not receive a response. I asked Mr. Bahçeli, I did not receive an answer. I’ve asked the AKP electorate, there is no answer. Then why have you brought this before the people?” he said, while adding that he was ready to discuss this on a media platform and determine whether it was for or against Turkey. The CHP leader said the argument of the elimination of “dual headedness” laid out by the proponents of the presidential system was vague and it only legitimized it, as the president, according to the amendments, would be both president and the secretary general of his party. “This is exactly how they will bring dual headedness to the state. The insurance of the state disappears. The presidency, which should ensure cohesion, will disappear,” he said, noting that the system change will pave the way for disagreements among future representatives of the state. Gallery | This entry was posted in Uncategorized and tagged CHP EU, kemal kilicdaroglu. Bookmark the permalink.